On the spring or fall equinox, when the noon Sun is directly over the equator, the sunlight flux incident on a surface area at a certain location on the Earth is a) proportional to the latitude angle (in degrees) of that location, b) proportional to the latitude angle (in radians) of that location, c) proportional to the cosine of the latitude angle of that location , d) inversely proportional to the cosine of the latitude angle of that location, or e) independent of latitude. 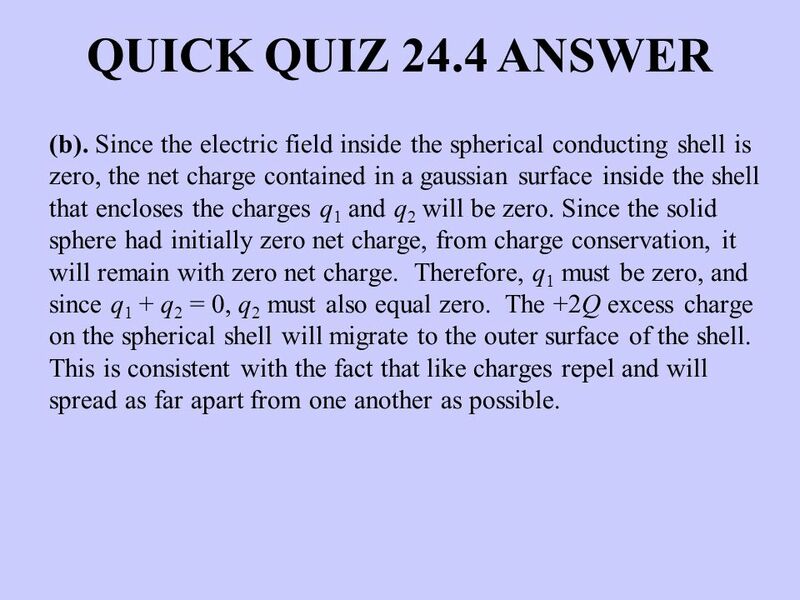 2 QUICK QUIZ 24.1 ANSWER (c). As shown below, the same number of flux lines are spread over a larger surface area of the Earth as the latitude angle increases. 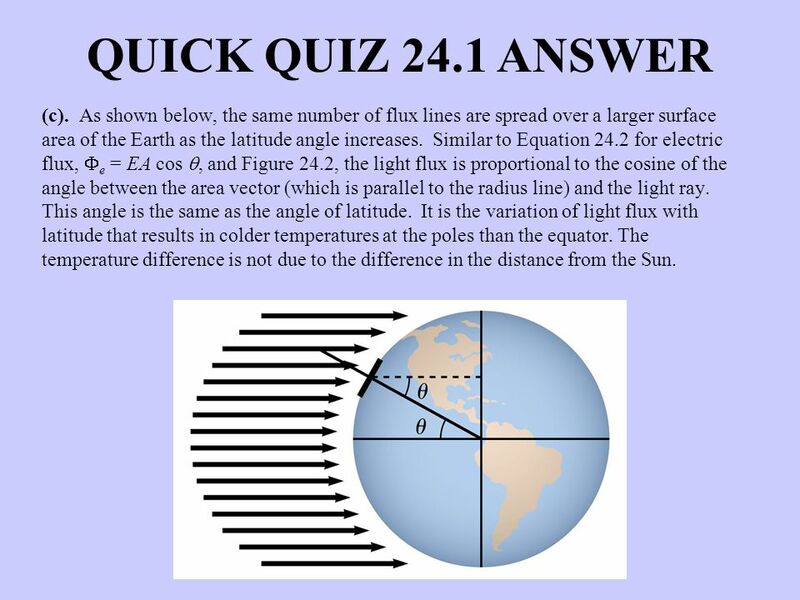 Similar to Equation 24.2 for electric flux, Fe = EA cos q, and Figure 24.2, the light flux is proportional to the cosine of the angle between the area vector (which is parallel to the radius line) and the light ray. This angle is the same as the angle of latitude. It is the variation of light flux with latitude that results in colder temperatures at the poles than the equator. The temperature difference is not due to the difference in the distance from the Sun. In Example 24.6, we determined the electric field due to a uniformly charged thin spherical shell. For the calculation of the electric field inside the shell, suppose we used a spherical gaussian surface that was not concentric with the shell. We would find that a) the electric field was zero over most of the gaussian surface, b) the electric field was zero at only a few points on the gaussian surface, c) the electric field was never zero on the gaussian surface but the sum of all the electric field vectors on the surface was zero, or d) we would not be able to determine the electric field on the gaussian surface. 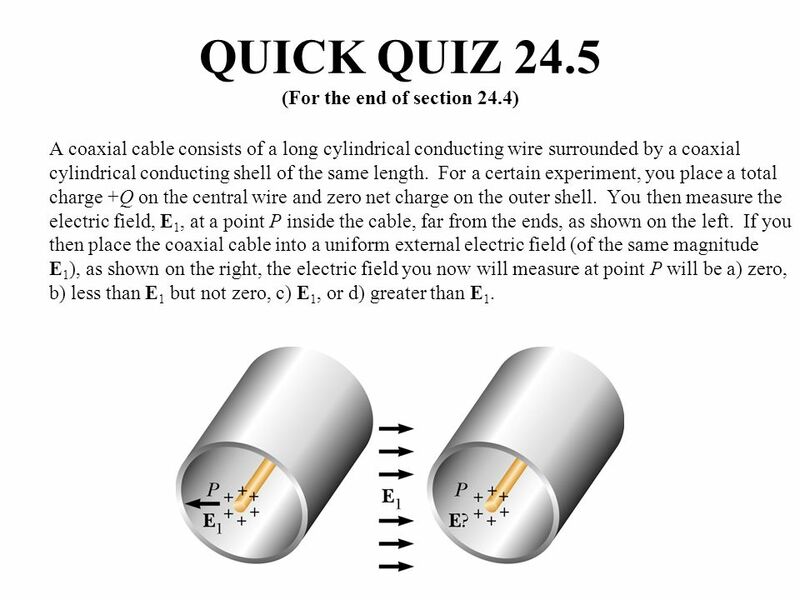 4 QUICK QUIZ 24.2 ANSWER (d). 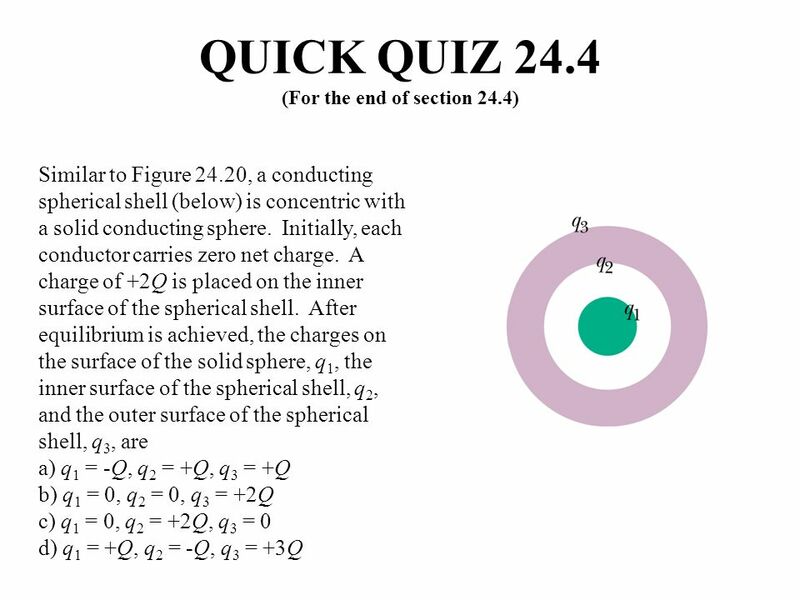 In the solution of Example 24.6 where we used a spherical gaussian surface that was concentric with the spherical shell, we established that the electric field was zero everywhere inside the spherical shell. 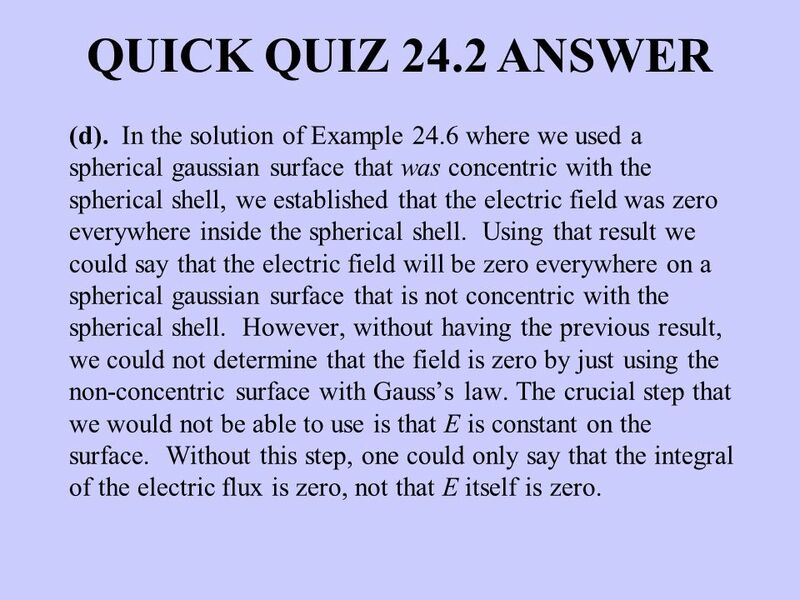 Using that result we could say that the electric field will be zero everywhere on a spherical gaussian surface that is not concentric with the spherical shell. However, without having the previous result, we could not determine that the field is zero by just using the non-concentric surface with Gauss’s law. The crucial step that we would not be able to use is that E is constant on the surface. Without this step, one could only say that the integral of the electric flux is zero, not that E itself is zero. Consider the electric fields E1 at a distance r1 and E2 at a distance r2 from the center of a uniformly charged insulating sphere of total positive charge Q and radius a. 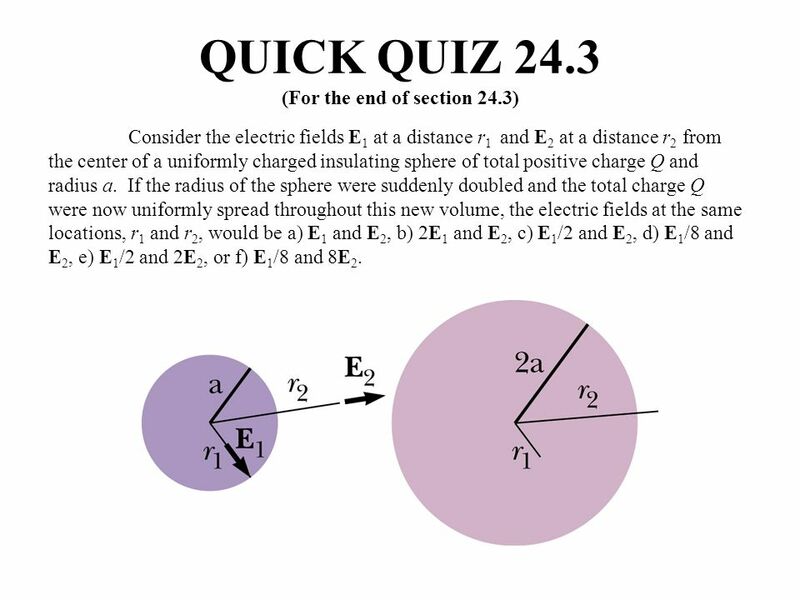 If the radius of the sphere were suddenly doubled and the total charge Q were now uniformly spread throughout this new volume, the electric fields at the same locations, r1 and r2, would be a) E1 and E2, b) 2E1 and E2, c) E1/2 and E2, d) E1/8 and E2, e) E1/2 and 2E2, or f) E1/8 and 8E2. 6 QUICK QUIZ 24.3 ANSWER (d). From Example 24.5, the electric field inside the sphere is proportional to the charge density and the distance from the center of the sphere. The distance does not change but the charge density is reduced by a factor of 8 (since the volume increases by a factor of 8) when the radius increases by a factor of 2. Outside the sphere, since the total charge has not changed and the distance has not changed, Gauss’s law shows that the electric field must remain the same. 8 QUICK QUIZ 24.4 ANSWER (b). 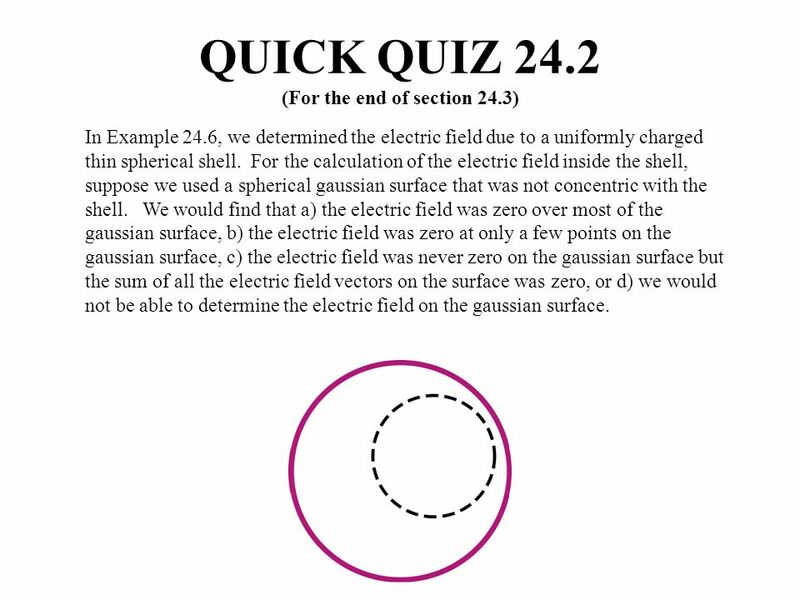 Since the electric field inside the spherical conducting shell is zero, the net charge contained in a gaussian surface inside the shell that encloses the charges q1 and q2 will be zero. Since the solid sphere had initially zero net charge, from charge conservation, it will remain with zero net charge. Therefore, q1 must be zero, and since q1 + q2 = 0, q2 must also equal zero. The +2Q excess charge on the spherical shell will migrate to the outer surface of the shell. This is consistent with the fact that like charges repel and will spread as far apart from one another as possible. A coaxial cable consists of a long cylindrical conducting wire surrounded by a coaxial cylindrical conducting shell of the same length. For a certain experiment, you place a total charge +Q on the central wire and zero net charge on the outer shell. You then measure the electric field, E1, at a point P inside the cable, far from the ends, as shown on the left. If you then place the coaxial cable into a uniform external electric field (of the same magnitude E1), as shown on the right, the electric field you now will measure at point P will be a) zero, b) less than E1 but not zero, c) E1, or d) greater than E1. 10 QUICK QUIZ 24.5 ANSWER (c). For the situation on the left, one may determine the electric field at point P by drawing a cylindrical gaussian surface around the wire, analogous to the method used in Example The electric field is dependent only on the charge enclosed in the gaussian surface from the wire, and the distance from the wire. By drawing a second cylindrical gaussian surface inside the cylindrical shell where the electric field is zero, one realizes that the inner surface of the cylindrical shell must carry a total charge of –Q to make the total charge contained in that gaussian surface zero. Since the net charge on the cylindrical shell is zero, a total charge of +Q must reside on its outer surface. For the situation on the right, all of the previous conditions are the same, except for the distribution of the charge on the outer surface of the cylindrical shell. 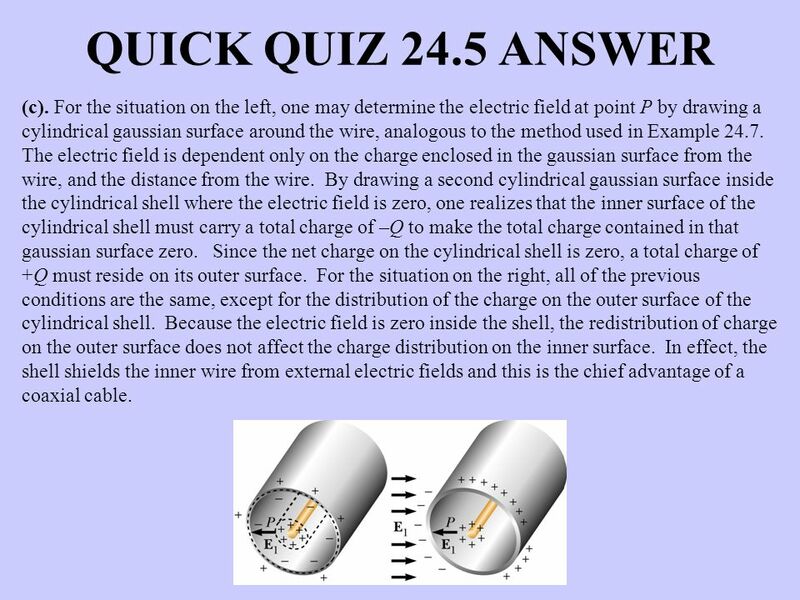 Because the electric field is zero inside the shell, the redistribution of charge on the outer surface does not affect the charge distribution on the inner surface. In effect, the shell shields the inner wire from external electric fields and this is the chief advantage of a coaxial cable. 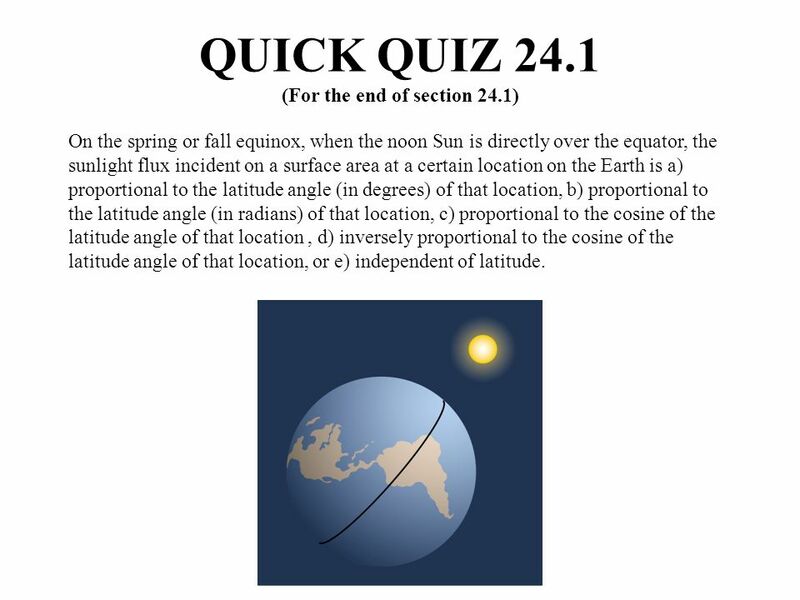 Download ppt "QUICK QUIZ 24.1 (For the end of section 24.1)"
Announcements Monday guest lecturer: Dr. Fred Salsbury. Solutions now available online. Will strive to post lecture notes before class. May be different. Physics 24-Winter 2003-L031 Gausss Law Basic Concepts Electric Flux Gausss Law Applications of Gausss Law Conductors in Equilibrium. The electric flux may not be uniform throughout a particular region of space. We can determine the total electric flux by examining a portion of the electric. Electric Potential AP Physics Montwood High School R. Casao. 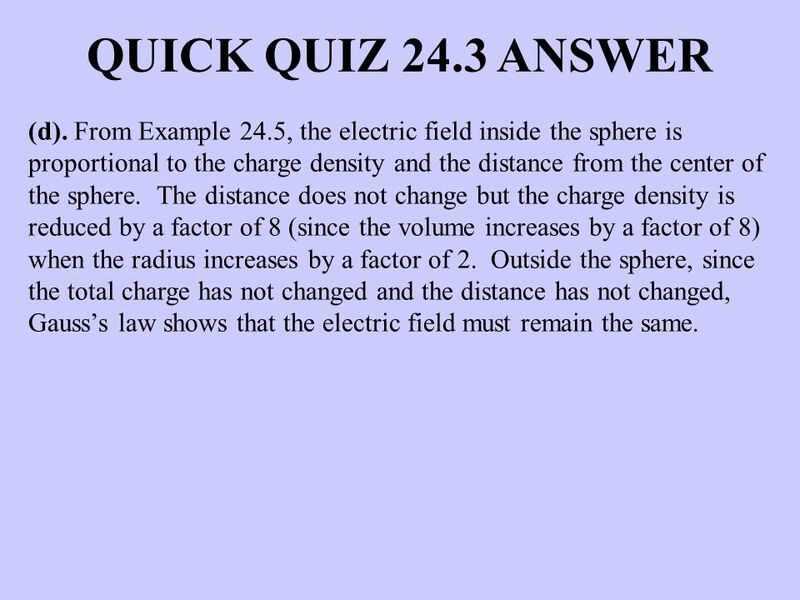 Copyright © 2009 Pearson Education, Inc. Chapter 21 Electric Charge and Electric Field. C. less, but not zero. D. zero. Karl Friedrich Gauss ( ) – German mathematician Ch 24 – Gauss’s Law. ELECTRICITY & MAGNETISM (Fall 2011) LECTURE # 5 BY MOEEN GHIYAS.